Offers easy access to the University of Colorado and the city of Longmont, as well as major companies and government contractors. 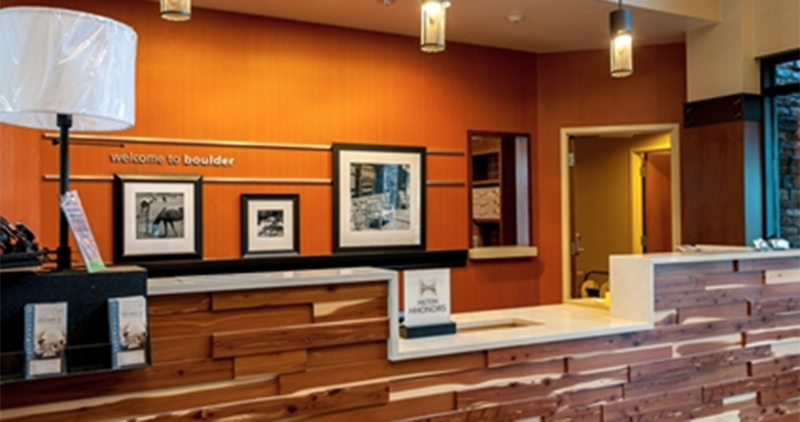 Welcome to the Hampton Inn and Suites Boulder North. Located in the Gunbarrel business district of North Boulder, CO, this LEED Certified hotel offers easy access to many government contractors, major companies, the University of Colorado and the city of Longmont. Visit nearby Boulder attractions during your stay, including the Flatirons, Chautauqua Park and Eldora Ski Resort. Feel at home in a comfortable guest room at this North Boulder hotel. Check emails with free WiFi, watch movies on the HDTV and enjoy a great nights' sleep on the clean and fresh Hampton bed®. Upgrade to a suite for more space and amenities, including a microwave, refrigerator and sleeper sofa. Every morning join us for Hampton’s hot breakfast buffet, or if you’re in a rush, grab a free Hampton On the Run™ Breakfast Bag, Monday through Friday. Enjoy free tea and coffee and advice on what to see and do in Boulder, 24-hours a day in the lobby. Hold an event at this hotel in Boulder in one of two flexible meeting spaces and stay connected with the free business center. Energize with a swim in the indoor pool or work out in the free fitness center. Unwind after a busy day with a glass of wine at our free manager’s reception, available Monday through Thursday evenings*.